Masters Section of the Southern United Hockey Club. Welcome to the Masters Section of the SUHC. 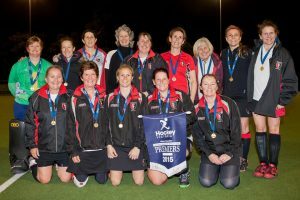 Masters hockey provides the opportunity for players to continue their hockey after the senior ranks or for new players to try hockey as a fun, social team sport. Currently men and women aged 32 and over are eligible to play Masters. We currently field 5 teams in the Masters competition – 45A’s, 45B’s, 45C’s and Ladies A & B grades. Our teams are always looking for more players of all abilities – from top grade players to people who have never played hockey before. Games are played on a Monday, or Wednesday for the ladies, during both winter and summer seasons – all organized by Hockey Victoria. This year we are looking at having a “come and try masters hockey” on a Monday night at 7pm. This will be targeting all those parents and players wanting to have a go. It is just small games and a bit of training. Contact Tim Cole on 0437190422 to express your interest. Please contact Suzie Styles our Masters Section leader if you are interested in joining the SUHC Masters Hockey section.